Contrary to what many might think, these images offer hope, not admonition, to radical feminists. I have often wondered if the traditional portrayal of the God the Father as the Ancient of Days (see my past article describing the reasons for this, here) might be causing Christianity more harm than good today. I don’t think I have met a single Catholic who believes that God really is an old man with a beard, but I have met many non-Catholics who think that’s what I believe! And this imagery might be to blame. Modern man seems incapable of grasping the nuanced (although absolutely legitimate) justification for the representation of the Father as the gray-haired figure. This imagery, it seems, fuels the prejudice of many today that Christians are simple-minded and superstitious, bigoted and sexist! What was a beautiful symbol that opened the doors to a subtle and nuanced understanding of the relationships between the persons of the Trinity, has become for modern man a distorted caricature. Here is my response to this. The reason for painting the Father as an older man is to illustrate by analogy with human experience the relation of the Father to the Son; it portraying Him as someone who could be a paternal figure to the Son. 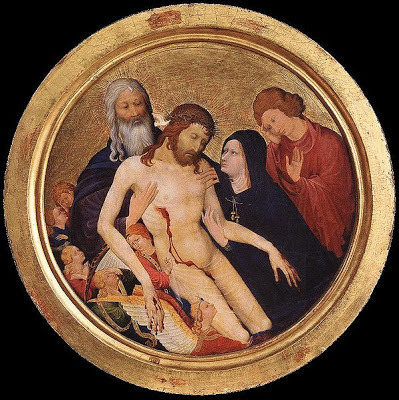 So in this painting, a Pietà with God the Father and the dove of the Holy Spirit, painted by the Frenchman, Jean Malouel in the early 15th century, we see a figure who is clearly intended to be the Father of his suffering Son. As recounted in Scripture, Christ refers to the first person of the Trinity as His Father. Contrary to the common accusation from those who are invested in identity politics, this is not intended to reinforce a patriarchal hierarchy on earth. The intention, which would have been clearly understood at the time, is not that natural fathers identify themselves with God, and so falsely elevate their own place in society. Rather, it is that every Christian, male and female, identify themselves with Christ in this painting. We are part of the mystical body of Christ; we die and overcome death with Christ through the sacramental life of the Church. Through Christ and in the Spirit we enter into the mystery of the Trinity in a dynamic of love - an exchange of agape - with the Father. We cannot hope in this life to understand the precise nature of the loving relationship between the persons of the Trinity, but by analogy, we can say that the First Person loves us as a good father loves his children, and we are the children in this scenario. 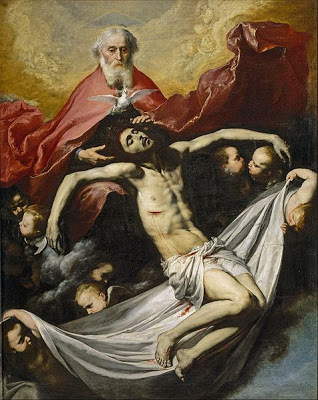 So the love which our natural fathers have for us, or at least ought to have for us, participates in some way in the nature of the perfect love that the First Person of the Trinity has for us, through Christ and in the Spirit. Nobody is excluded; this profound privilege is extended to every single person. This could not be more inclusive and it is the intention of such artworks to reflect this truth. The different aspects of love between people are different facets of divine love, and participate in it. It is through aggregating the myriad of human relations that we experience and see around, and so discern, if only dimly, the nature of divine love. Paternal love is distinct from maternal love. The love of our natural mothers, again by analogy, direct us, the children, to the love that binds us to Mother Church and to Mary as the Mother of the Church, and that love is fully realized in God and his love for us. The same can be said of filial love - it is exemplified and was fully realized in Christ’s friendship with His Apostles, and realized too in God’s love for us. All these different expressions of love are given to us as Christians. So much of today’s gender wars, I feel, emanate from a poor grasp of the Christian understanding of both human and divine love. It is more common, through the popularization of the Theology of the Body, to focus on nuptial love as a type for God’s love, and rightly so. But we should be careful not to neglect what the types of paternal, maternal and filial love tell us about God’s love too. The careless use of this imagery is not the cause of such misunderstandings, but there is a danger that it will reinforce them once they are there. So if we are to use it, we must work harder to explain their meanings to others, beginning with other Christians around us. If we can do that, we might have a powerful way of answering our critics.